Last Thanksgiving, in pre-holiday mode, I got on my 1980 Meral and rode to my local grocery store to stock up on a few supplies needed for our holiday dinner. One of the nice things about being a vegetarian means not carting around a 20 lb turkey. However, I did discover that veggies can also be quite heavy. 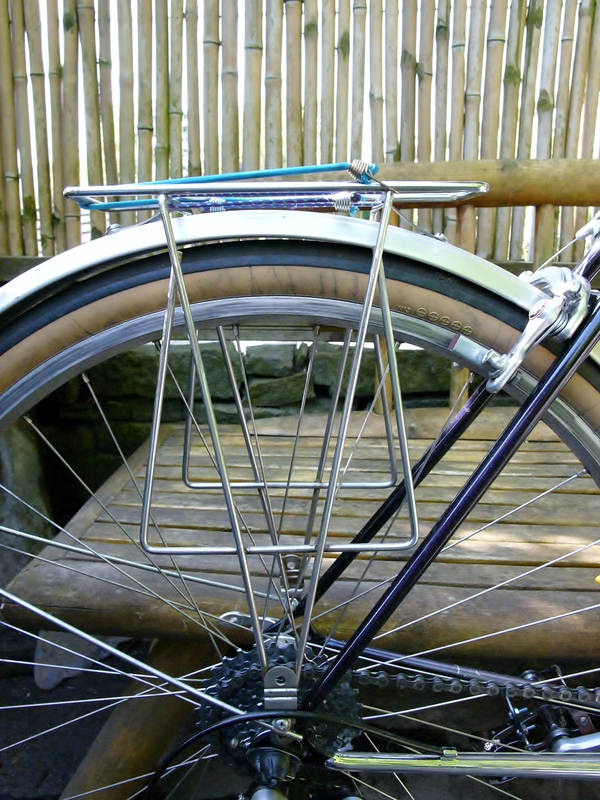 When I loaded them into the panniers I had thrown over these modest F. Fiol front and rear racks (which mount only to the fenders and not to the frame), something bad happened. The bike went nowhere. 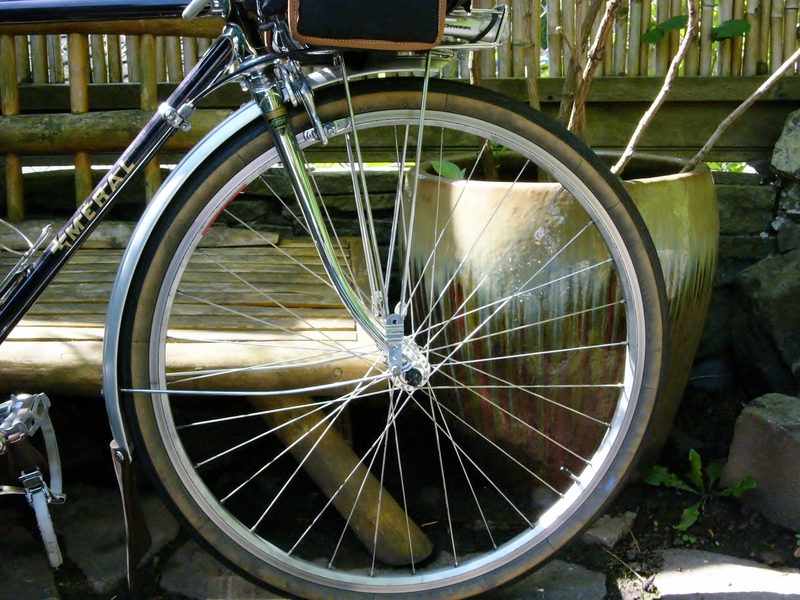 The rear rack sunk down into the fender, and moved the wheel out of its dropout. I had to dismount and carry the bike to a sidewalk where I could troubleshoot the problem. Unfortunately, the rear fender had altered its position so significantly that I could not ascend back home. I had to call for help. 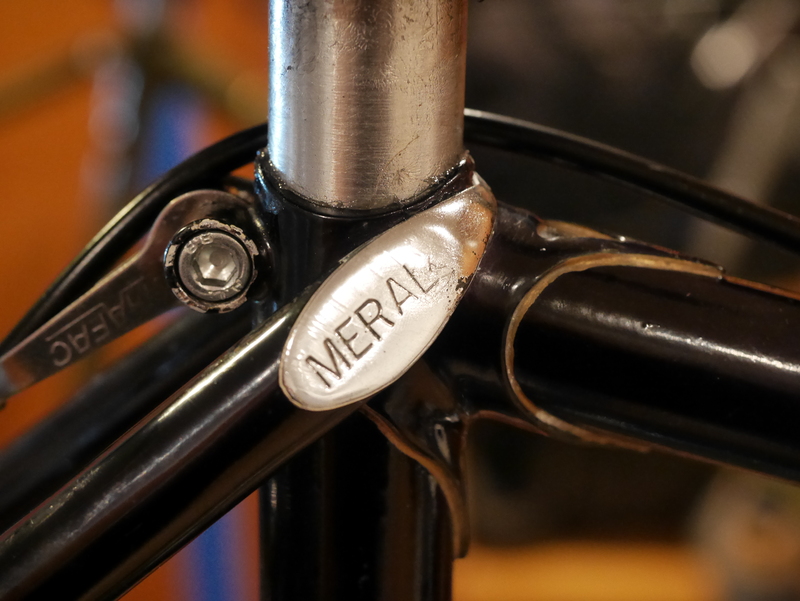 Once I had the Meral back at my shop, it became clear that I needed to replace the F. Fiol rear rack with something more robust. Racks are very tricky, as most mechanics know, and it can be challenging to find the right rack to work with your bike to provide the utility you need. 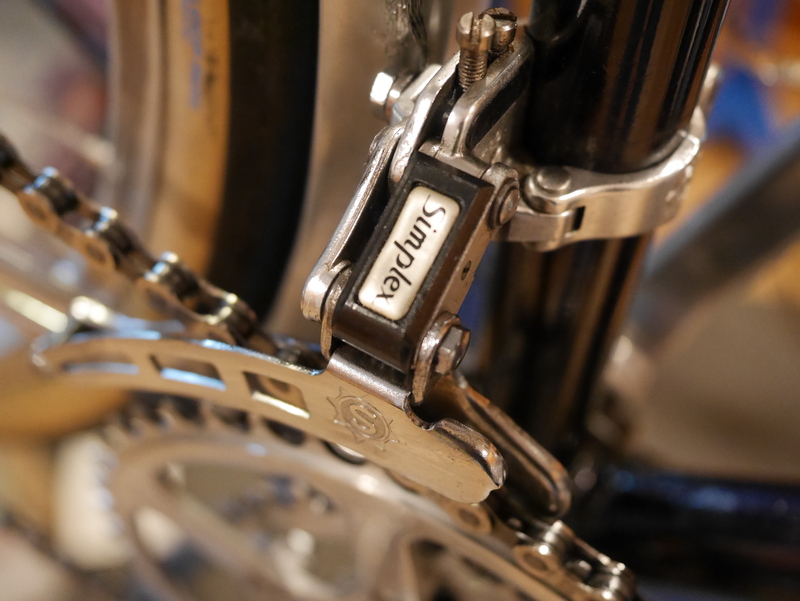 I eyeballed a number of racks that I had on hand, and decided to go with this Blackburn rack which I had previously taken off a 1980’s Miyata touring bike. It’s very strong and has a number of useful features. The rack fit perfectly to the frame, and was level without any modifications needed. I used P-clamps to mount the rack stays to the seat stays (because this frame has no rack mounts). I used these Nitto clamps, pictured above, which were leftover from another project. These clamps are very robust, and protect the frame’s paint. Even so, I taped the frame underneath the clamps with electricians tape, just in case. Because…things can go wrong. 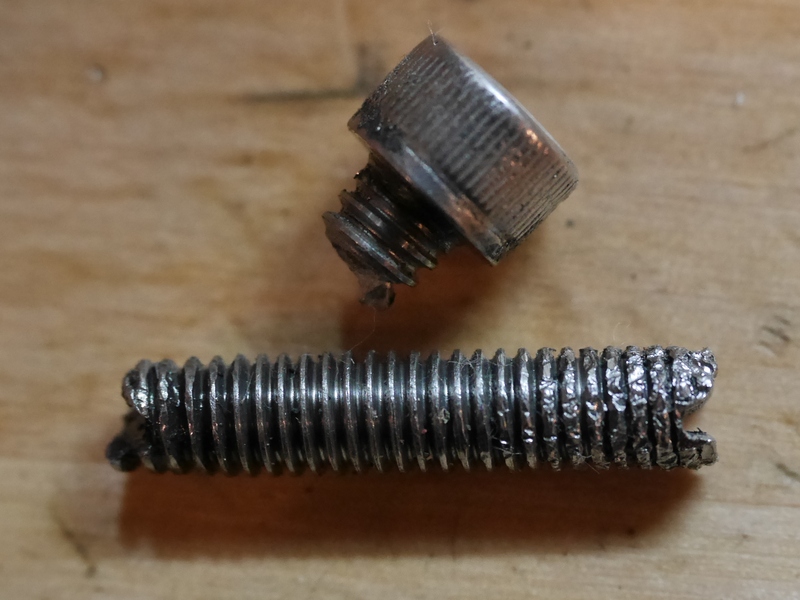 As I was putting the frame into the work stand, I managed to break the seatpost bolt head right off. That might be one indication that I’ve put this frame in the shop stand too many times. The ensuing panic finally resulted in relief when I took my Dremel and cut screwdriver slots into each side of the remaining bolt. It took quite a while to rock the bolt in and out using a screwdriver and vise grips, but I finally got it free. Yeehaw! 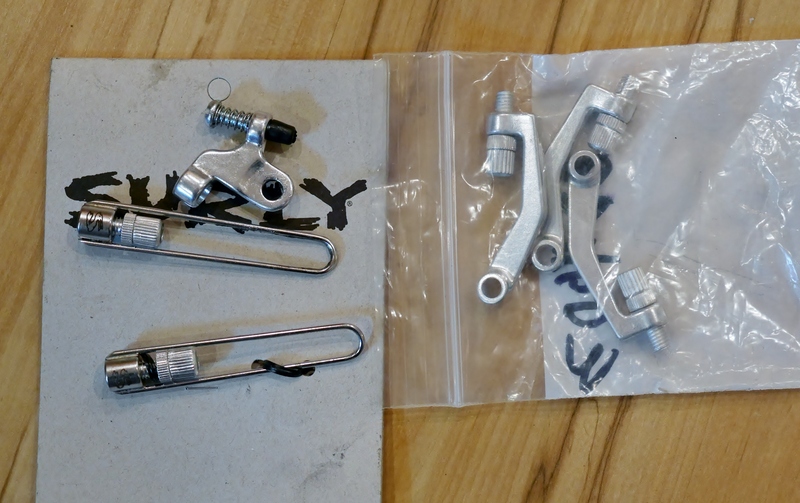 Brake hangers – Surly and Problem Solvers. I had contemplated changing my “smooshed” Mafac rear brake hanger with a different application. Unfortunately, nothing else was suitable. 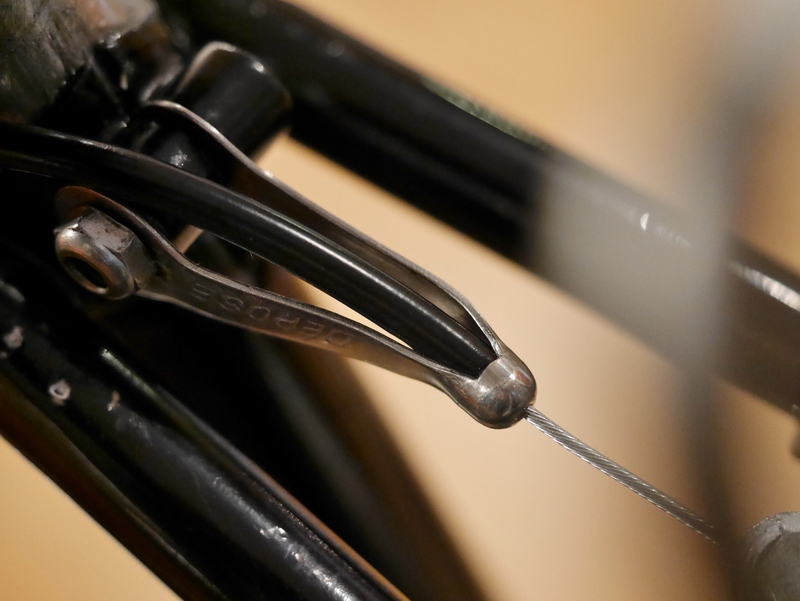 It is challenging to mount a rear hanger on a smaller frame. 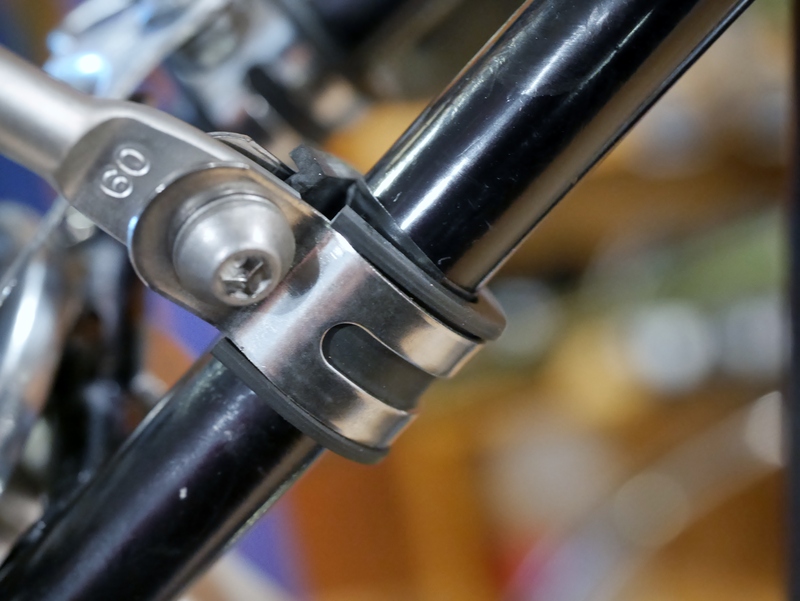 The Surly hangers would have been perfect, except they were too long and didn’t allow for the requisite 20 mm of clearance above the Mafac straddle cable. And, the Problem Solvers hangers were too thick at the seatpost mounting ring, so could not be used with the Meral seat post clamp. (Problem Solvers is great resource and worth checking out.) Fortunately, the Mafac hanger works just fine. Now that the bike was in the shop stand, it was time to think of other modifications that I had been contemplating for this bike. I had been using a T.A. triple crankset with 48-40-28 rings. The big ring had a massive wobble that I had corrected a few times by smashing it between two planks in my vise. I decided that it was time to go with a smaller big ring, and convert the crankset to a double. 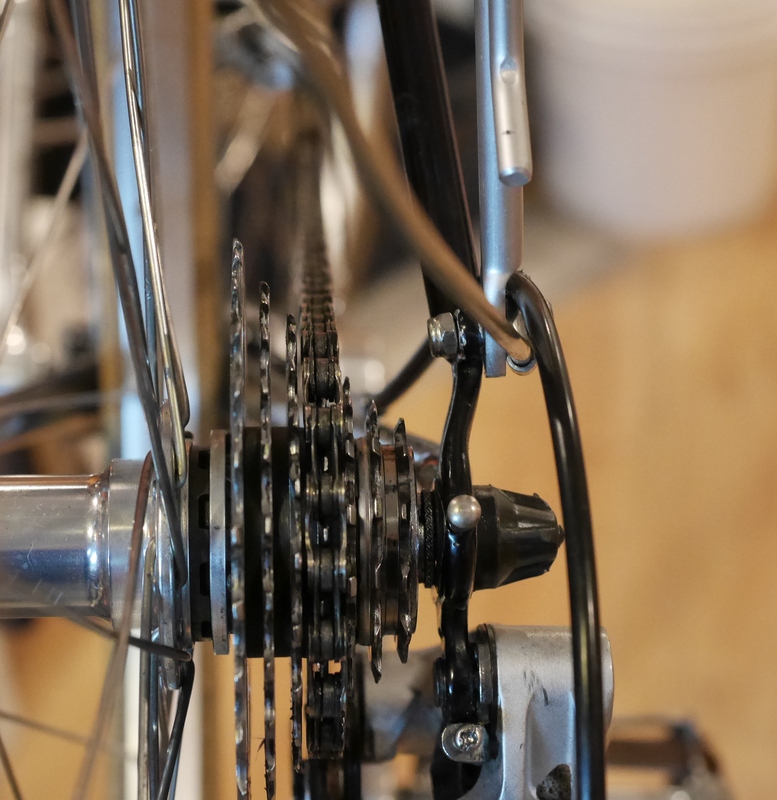 T. A. cranks, with their tiny bolt circle diameter should only be used with smaller chainrings, because the small diameter bolt circle can cause the big ring to flex under load. So I sourced these beautiful new rings – a 44 and a 28, and converted the drive to a double. Changing out the front rings meant an evaluation of the rear cassette. 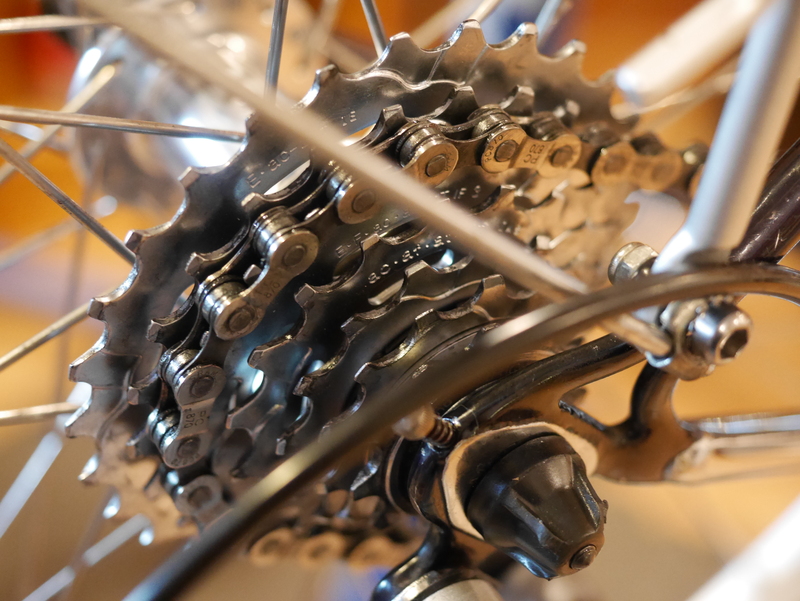 I decided to use a 7 speed Shimano 11-28 cassette, to help adjust the resulting chain line. The Simplex Super LJ is very happy with this double chain ring set up, and was designed to shift rings with large teeth differences. Now, we’ll see how this works out on the road. 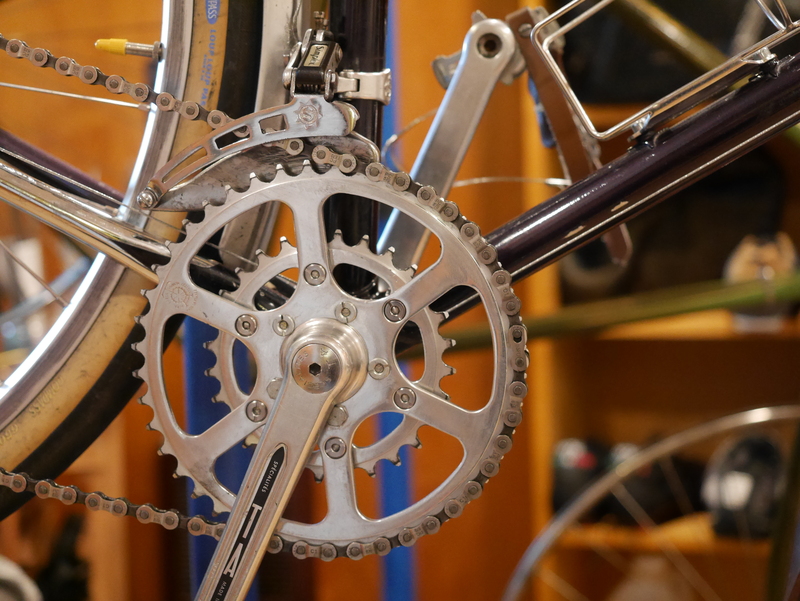 This entry was posted in 650B, 650b conversion, Bicycle restoration, Meral, Racks, Simplex derailleur, Vintage bicycle restoration and tagged 650b, 650b conversion, bicycle restoration, Mafac Raid, Meral, randonneur, removing broken bolt, Simplex Super LJ, T A crankset, vintage french bicycle by Nola Wilken. Bookmark the permalink. Thanks – I’ll see how the new (old) rack performs. 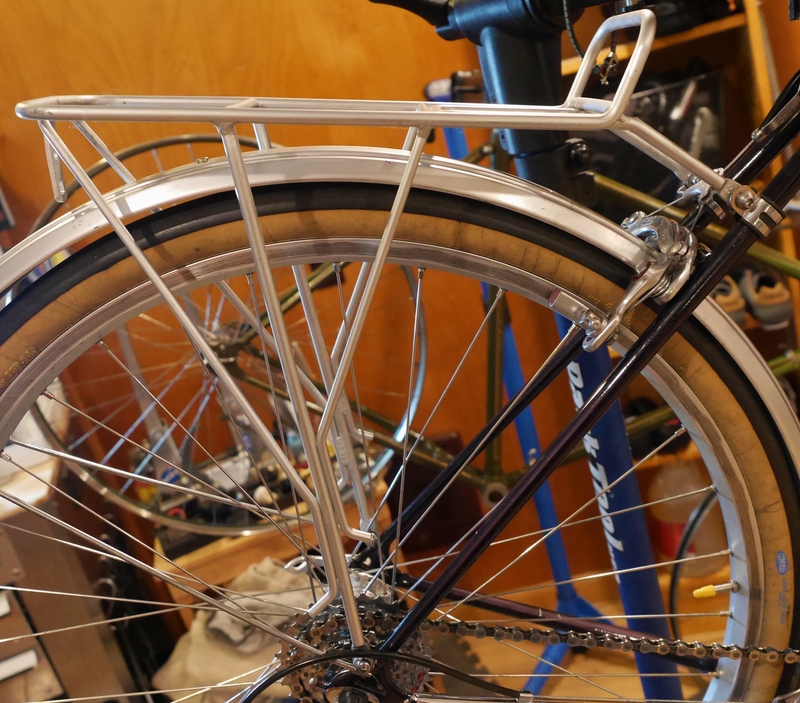 The fenders are from my old Centurion Pro Tour – they have about 40k miles on them but still look great.